Today's vintage find is from Betsy Sammarco who writes, "This is a very special item in my house. It may not look like much. As a matter of fact, it even has "vintage goop" stuck on one side of it. 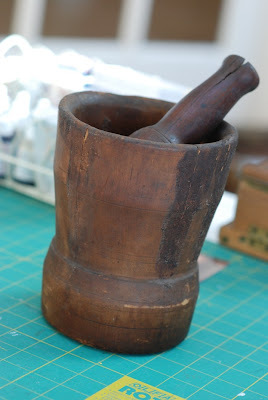 This old wooden mortar and pestle was a birthday gift to me years ago from my mom. It was given to me the birthday after I graduated from pharmacy school and passed my licensing exam. What a very special and appropriate gift to give to this vintage-loving-pharmacist! This gift says a lot about me and is so much of who I am. I've mostly had it on display in various places around the house, but lately have been using it as storage for my chandelier crystals. 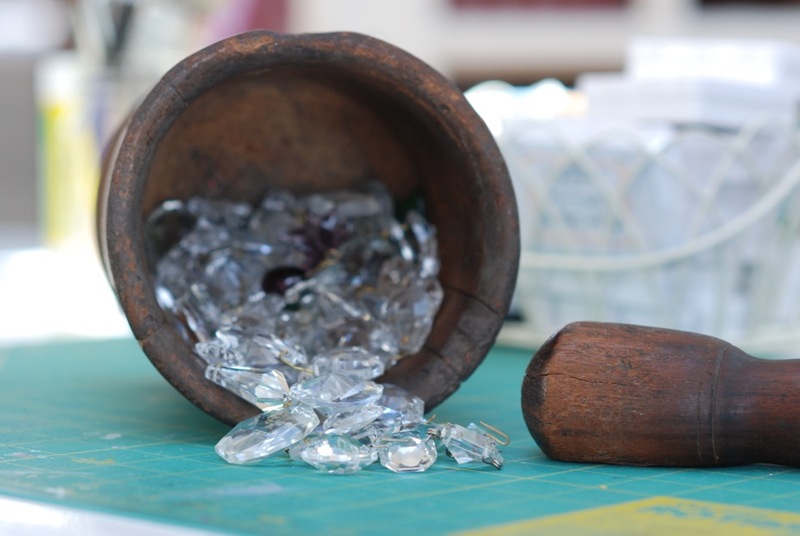 This vintage find holds my crystals today and holds a very special place in my heart always!" Thanks for sharing a treasured "vintage" memory with us Betsy! How special, even with the goop! TFS. Congrats on your exams and career. I bet your Mother was very proud! My son just got his second paycheck for his new pharmacy tech job and i'm so happy for him to have gotten his foot in the door...if he likes it, who knows maybe he will go for more education later. A mom can dream.